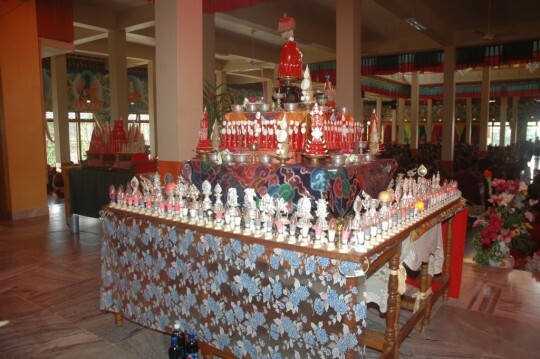 Extensive torma offerings during Extensive Most Secret Hayagriva Puja offered monthly at Sera Je Monastery on behalf of the entire FPMT organization. 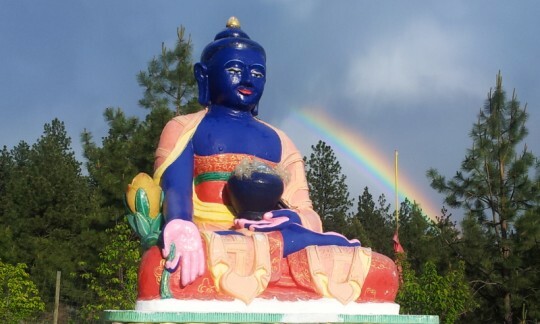 Twenty-three years ago, Lama Zopa Rinpoche established the Puja Fund as a way to sponsor ongoing prayers and practices dedicated to the success and longevity of the entire FPMT organization. 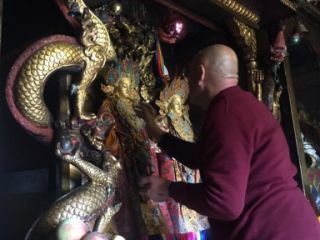 One puja that Rinpoche advised as particularly important for FPMT, due to the organization’s close connection with the deity Hayagriva, is the Extensive Most Secret Hayagriva Puja. 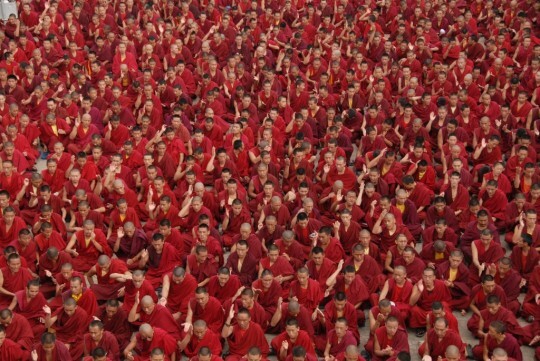 Every month, on the Tibetan 29th day, the Puja Fund sponsors about 40 of the most senior monks of Sera Je Monastery, who specialize in the practice of Most Secret Hayagriva, to offer the Extensive Most Secret Hayagriva Puja. This is an all-day puja with an elaborate torma offering and extensive prayers and meditation. The Puja Fund makes a small offering to the 40 monks who perform the puja, sponsors tea, and covers the cost of extensive torma offerings for the puja. 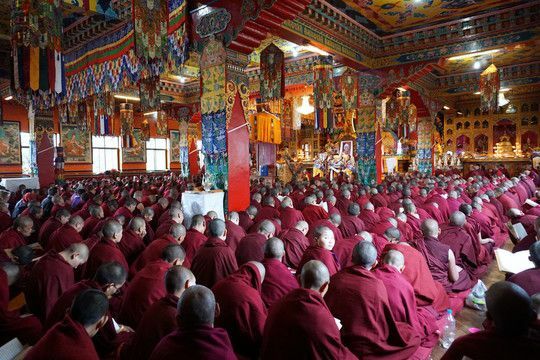 In this way, the puja not only benefits all FPMT centers, projects, services, students, benefactors and those serving the organization in any way; it also benefits the monks of Sera Je Monastery. Please rejoice that this powerful puja is done every month for the entire FPMT organization. All are welcome to participate in this monthly puja by offering any amount to the FPMT Puja Fund. Lama Zopa Rinpoche with the monks of Kopan Monastery, Nepal. Photo by Ven. Roger Kunsang. 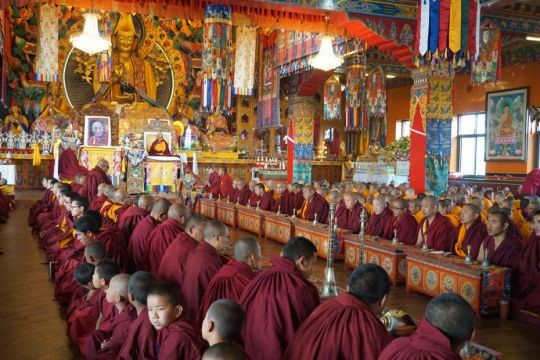 Each year on Chokhor Duchen, one of the four great holy days of the Tibetan Buddhist calendar, The Puja Fund sponsors pujas and offerings all over the world dedicated to the success of the entire FPMT organization. 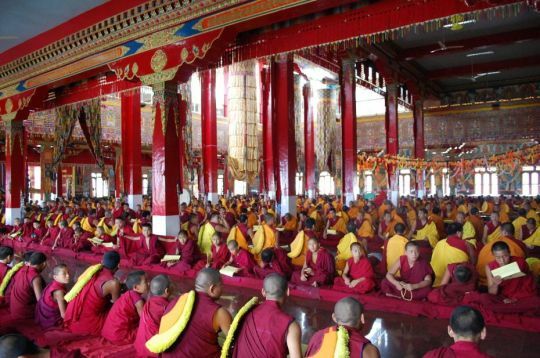 This year Chokhor Duchen takes place on Monday, July 16. The practices are done by up to 15,650 ordained Sangha and offerings are made to each in appreciation of their time and service. 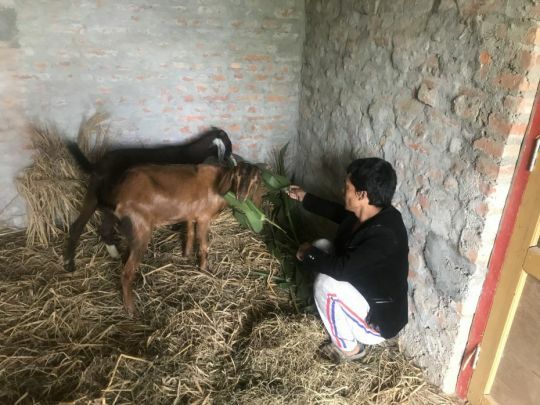 On these holy days the merit of any action is multiplied by 100 million — so this is not only an incredible support to the individual monks and nuns, it also is a way to invest in the monasteries and nunneries where the pujas and practices are offered. 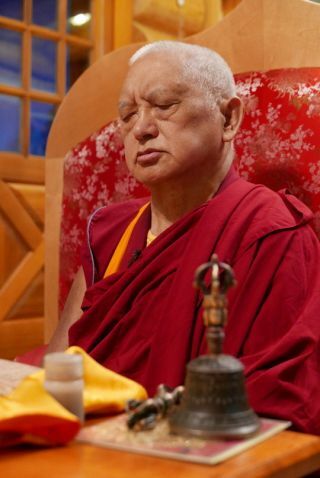 Recently Lama Zopa Rinpoche commented, “Remember, all these monks are disciples of His Holiness the Dalai Lama, so if you have received teachings from His Holiness the Dalai Lama, because all these monks are disciples of the same guru, for you they are the pores of the guru. “‘Pores of the guru’ does not only refer to the body, it refers to the disciples of the same guru. It also refers to the neighbors of the guru and, if the guru is lay, it refers to the guru’s husband, wife and children as well, and even the guru’s horse, dog, and belongings. ‘The guru’s pores’ refers to all these things. “So think: ‘I am making offerings to the same guru’s pores.’ Then, no matter how many monks there are, no matter how much money-offering you make, or offerings of tea, bread, or lunch, you will get the same merit as actually having offered to numberless Buddhas, Dharma, and Sangha. 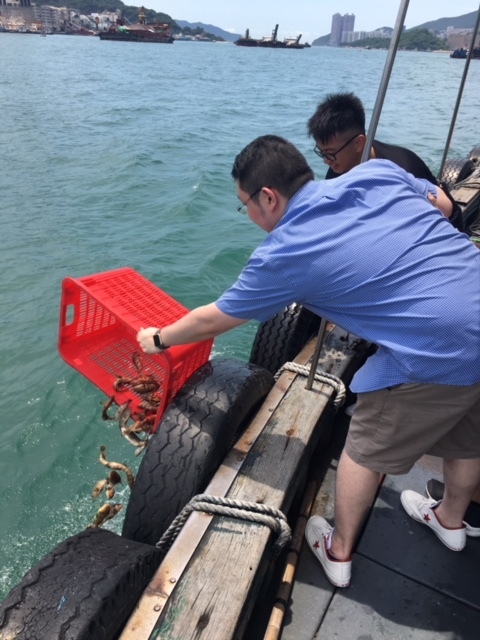 You collect the same merit as having made offerings to them. Robes offered to the Shakyamuni Buddha statue at the Mahabodhi Stupa in Bodhgaya, India, through the Puja Fund on every Buddha holy day. Photo by Andy Melnic. All are welcome to participate in these incredible offerings including: Recitation of the Prajnaparamita (short, medium and long versions) by the monks of Gyurme Tantric College, recitation of the entire Kangyur by the nuns of Kopan Nunnery, extensive offerings for Lama Zopa Rinpoche’s gurus and holy objects in India and Tibet, among many other virtuous activities, prayers and pujas which were advised by Lama Zopa Rinpoche. Even offering one dollar to the Puja Fund for Chokhor Duchen (July 16) means that you are offering toward all of the activities being sponsored. Additionally, all are welcome to participate by rejoicing in the many pujas, practices, and offerings which will be offered. 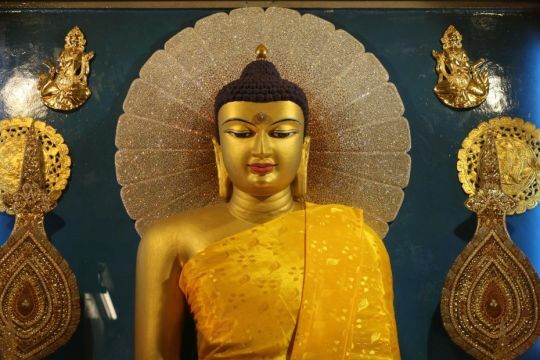 Buddha statue in Bodhgaya is offered new robes by the Puja Fund. Saka Dawa is the most important Tibetan Buddhist festival day, celebrating Lord Buddha’s birth, enlightenment and parinirvana. 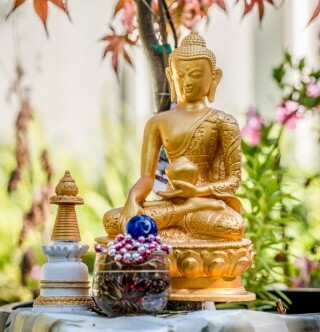 Buddhists around the world engage in many auspicious and merit-making activities such as sponsoring or engaging in beneficial pujas, practices, and prayers; and making extensive offerings to teachers, holy objects, and auspicious charitable activities. This year, Saka Dawa takes place on May 29. 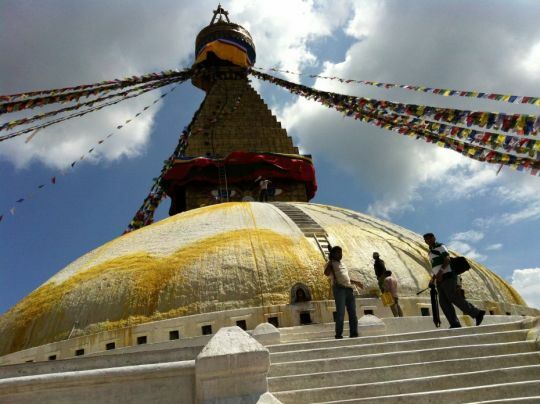 Offerings of white wash, four giant saffron flower petals and the best quality cloth to the umbrellas at the pinnacles are made to the Boudhanath and Swayambunath stupas in Nepal. 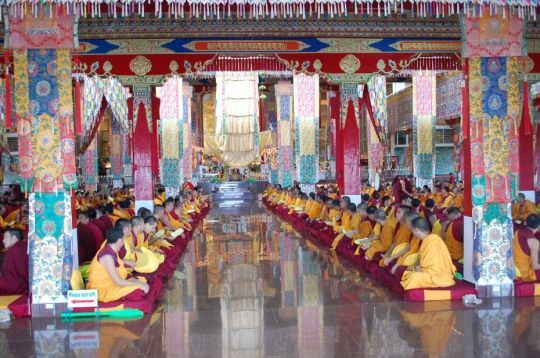 The FPMT Puja Fund was established so that pujas and prayers, offered by as many as 15,650 ordained Sangha, would continuously be sponsored for the benefit of the entire FPMT organization. 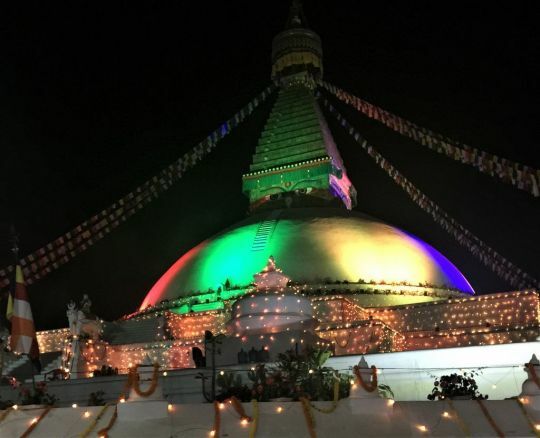 On Buddha Multiplying Days, such as Saka Dawa, when karmic results are multiplied by one hundred million, the Puja Fund offers US$10,000 toward an extensive array of pujas and practices. 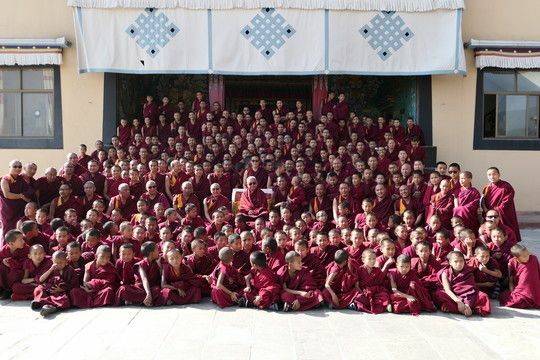 This is a very auspicious way for FPMT to support the Sangha at various monasteries and nunneries in Nepal and India. 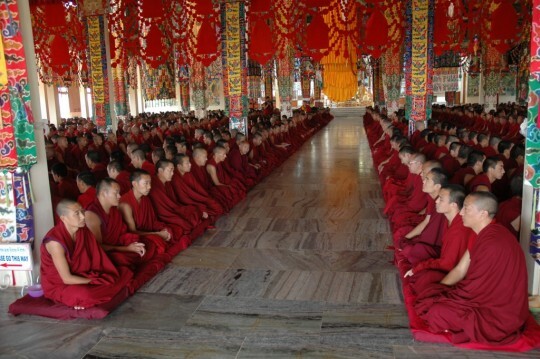 Providing prayer services such as these allow the ordained Sangha to benefit others while also supporting themselves. Lama Zopa Rinpoche and Sangha at Kopan Monastery offering puja. 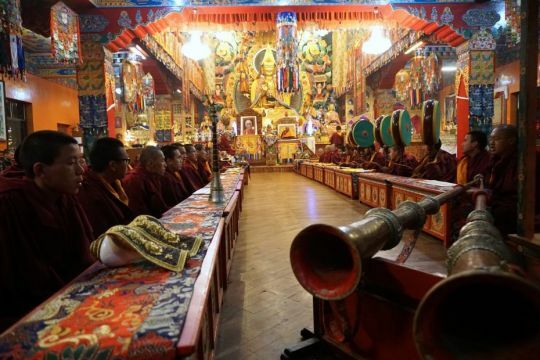 Additionally, the Puja Fund makes offerings to all of Lama Zopa Rinpoche’s gurus; to over 15,000 Sangha from Sera Je and Sera Mey Monasteries; Gaden Jangtse and Shartse Monasteries; Drepung Gomang, Loseling, and Deyang Monasteries; Gyurme and Gyuto Tantric Colleges; as well as Kopan Monastery and Nunnery; to Sangha at International Mahayana Institute (IMI) communities; and holy objects in Nepal, India, and Tibet. You can see details about all of these activities here. This is an incredible day of celebration and offerings when skies of merit is created for the entire FPMT organization including all centers, projects, services, students, benefactors and those serving the organization in any way, as well as all beings. All are welcome to participate in this beneficial celebration by remembering any of these practices and offerings happening around the world and then mentally offering this oneself and/or rejoicing. You can also make a financial contribution to the many prayers, practices, and offerings sponsored by the FPMT Puja Fund. You can participate by offering even one dollar. Every month the Puja Fund sponsors pujas and offerings dedicated to the long life of His Holiness the Dalai Lama; the removal of obstacles to all FPMT Dharma activities; FPMT students; benefactors of every FPMT center, service, and project, as well as their families; all beings who have passed away; and benefactors of the FPMT Puja Fund. On the eighth day of every month of the Tibetan calendar, a Medicine Buddha puja is sponsored at Sera Je Monastery and offered by 2,000 monks. A small money offering, bread, and tea are given to every participating monk and the cost of light and torma offerings for the puja are sponsored. On the twenty-ninth day of every month, an important day to offer protector pujas, forty of the most senior monks of Sera Je Monastery, who specialize in the practice of Most Secret Hayagriva, are sponsored to perform the Extensive Most Secret Hayagriva puja (Hayagriva Tsog Kong). This is an all-day puja with an elaborate torma offering, extensive prayers, and meditation. 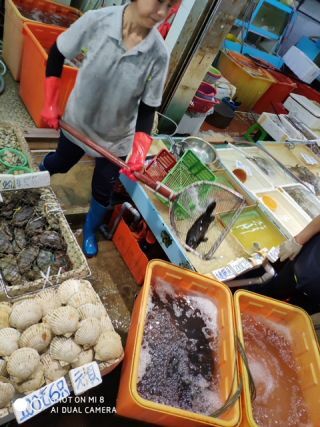 A money offering, breakfast, lunch, and dinner are given to each participating monk; and the Puja Fund also offers the cost of extensive torma offerings for the puja. 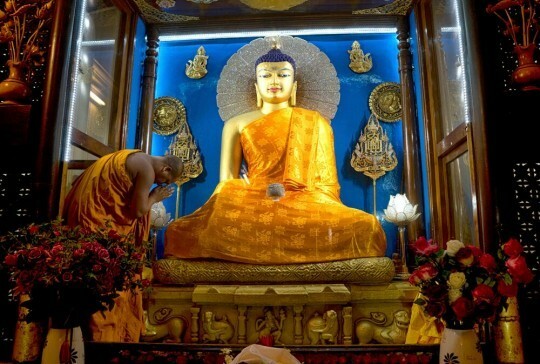 Robes are offered every month to the Buddha statue in Mahabodhi temple, Bodhgaya, India. Photo by Andy Melnic. 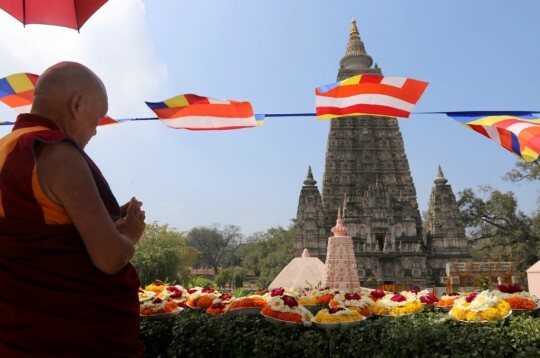 A new set of robes is offered every month to the precious Buddha statue inside the Mahabodhi Stupa in Bodhgaya, India. Thanks to Root Institute for kindly organizing this every month. 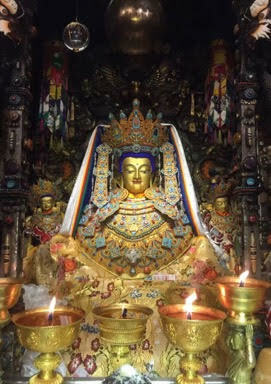 Every month on the full moon the Puja Fund sponsors the offering of gold and robes to the most holy Jowo Buddha statue in Tibet. Please rejoice in these monthly pujas and offerings to Sangha and holy objects sponsored by the Puja Fund. These pujas and practices are a direct and important investment in FPMT’s current and future successes.